Teaching cats to do things on command is easier than you may think. All it takes is a little patience and consistency in the training process and you will discover just how rewarding the result can be. When your Ragdoll cat obeys your command he receives Praise and a Reward, if he does not obey he gets nothing, this reinforces the positive behaviour in the cat's mind. To avoid confusing your Ragdoll cat only teach one trick at a time and keep the training sessions short (10 minutes maximum) or else he will lose interest. Start with your Ragdoll cat sat in front of you. Say the command 'Shake a Paw' and touch your cats paw, when your cat reacts to your touch shake its paw and give verbal praise and reward with a treat. Do this several times a session using the same command and response each time, remember be consistent. This command is best taught to your Ragdoll cat around meal times and will train it to come to you on command. 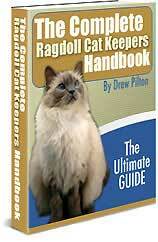 Call your Ragdoll cats name followed by the 'Come' command and tap on your cat's food container. Greet their arrival with verbal praise and reward them with their meal. Do this every mealtime, your cat will associate the 'come' command with food and come to you every time you use it. Start with your Ragdoll cat sitting in front of you. Hold a treat over its head and give the 'Sit Up' command. If they sit up give them verbal praise and reward them with the treat, don't let them reach the treat or grab it until they have obeyed your command.